Are you sure you want to know? : What did you do this weekend? A friend of ours celebrated a birthday this weekend. He is part of the Chi-Town Squares Square Dancing Troupe, which was having it's Friends & Family event so he invited all of his friends to come to the event instead of having a party. The Boyfriend and I had no idea what to expect, we didn't know what to wear, I just got rid of all my cowboy shirts so I went Dickie's Butch and The Boyfriend went Cowboy Butch! Well we had a blast, we danced for two hours, and we even broke a sweat. And considering that I'm "dance challenged" that means a lot! They had a member team up with a non-member and they taught us how to dance. We do-see-doed and did an alamand right and did a grand left something or other, we also did a swing and a four ladies in the center with a courtesy turn. 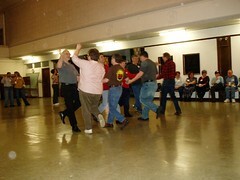 The great thing about going to a Gay Square Dancing event is you can either be the boy or the girl.....considering we had no idea what we were doing, we ended up both being "girls" because they follow. The last time I square danced professionally was in the 5th Grade when we did a May Day performance. It brought back a lot of memories and we had a blast, we laughed and laughed. Well Saturday we had dance class and then not one, but TWO birthday parties. The first one was family, so I had to go to, but the second one I was able to just drop her off. Sunday I rested. A lot. I slept most of Friday, and laid on the couch most of Saturday. The last time I square danced was at GayCamp! YAY! It's fun, but alot of running around. I did nothing exciting on Saturday. Groceries, got my eyes checked and ordered new contacts and glasses. Then sat outside in the sun a worked a bit. Sunday was a rainy day, we we did very little. Seems like you had a really good time. Drove to Detroit but when I saw the signs for Detroit right next to the signs for Chicago, I was all "Oooooh, which one? which one?" We went to Detroit but you know my heart was with you in Chi-town dancing!